We have come to the stage of our build when it is time to connect the extension to the house. We will knock a hole in the back wall of the cottage but first we are building the walls on the little connection part. 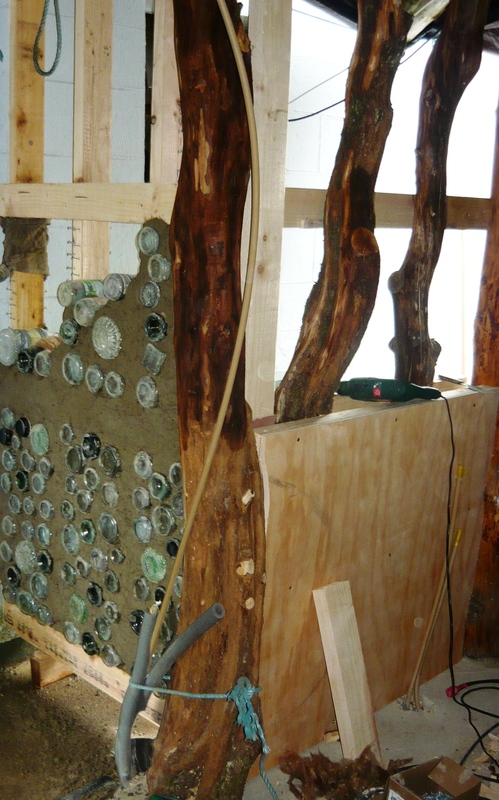 We wanted the space to be as light as possible so decided to put in another bottle wall. 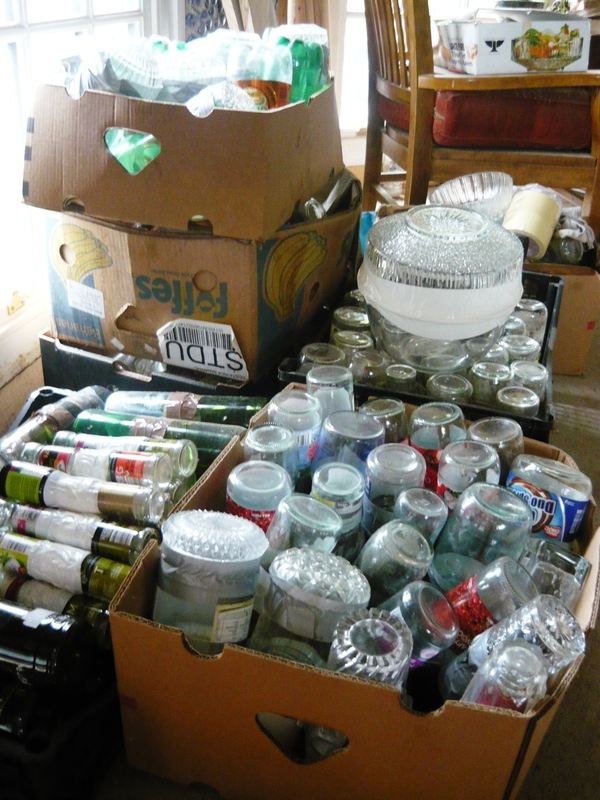 Two days were spent recently cleaning; fitting and taping our glass bottle and jar bricks. 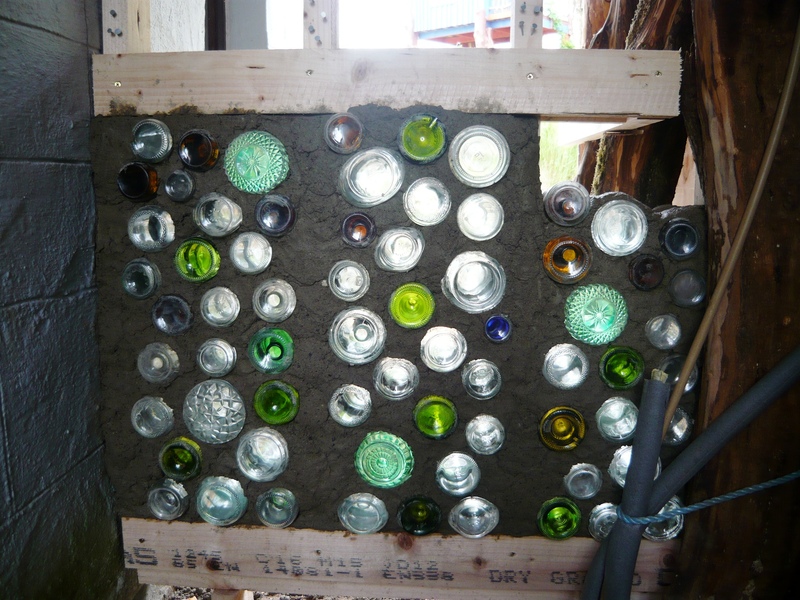 It takes a lot of glass bricks to build a wall so if you are planning a build like this, start collecting jars and bottles at once. Duct tape is best we find, but in a pinch brown parcel tape will do. 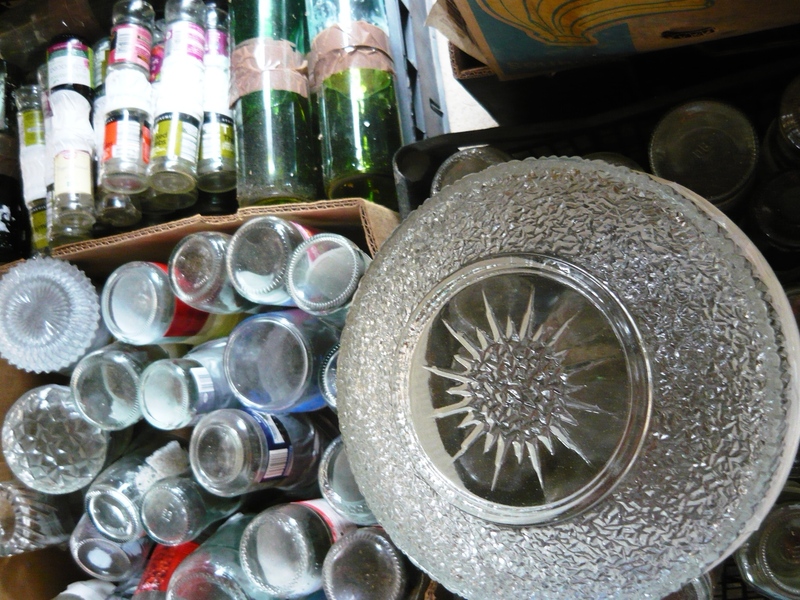 We have been collecting a lot of decorative small glass bowls on our charity shop rambles, and they are a nice addition to the walls. 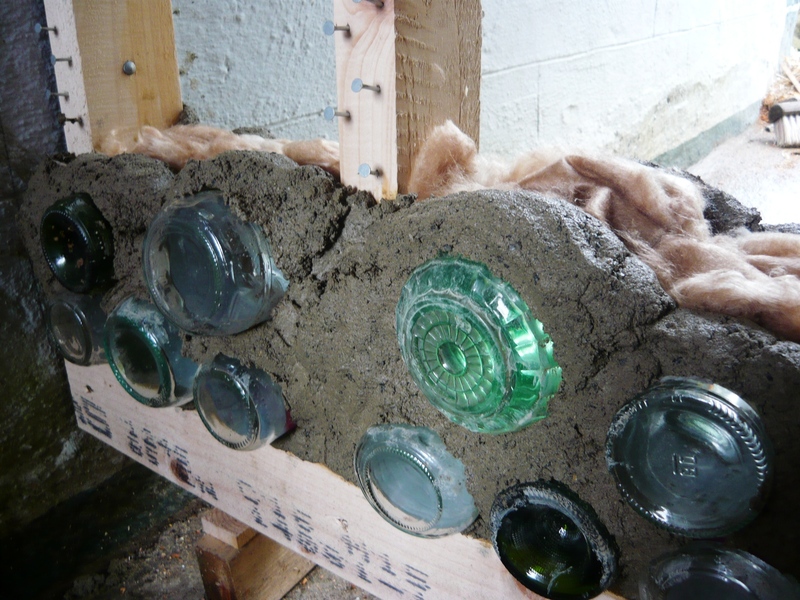 To make bricks out of them we use big soft drink PET- bottles. 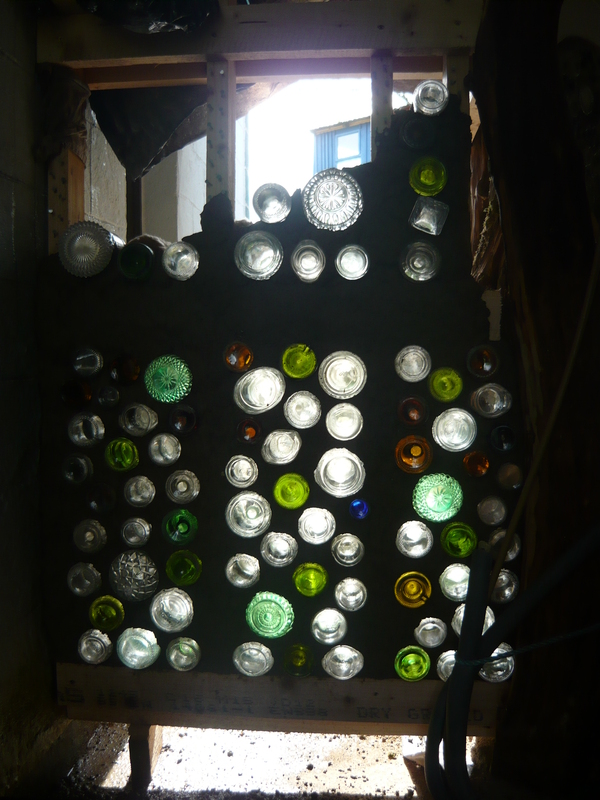 This wall will not get a lot of direct sunlight so the bottles should be strong enough. It is only the very thick bottom part that is exposed to the elements anyway. 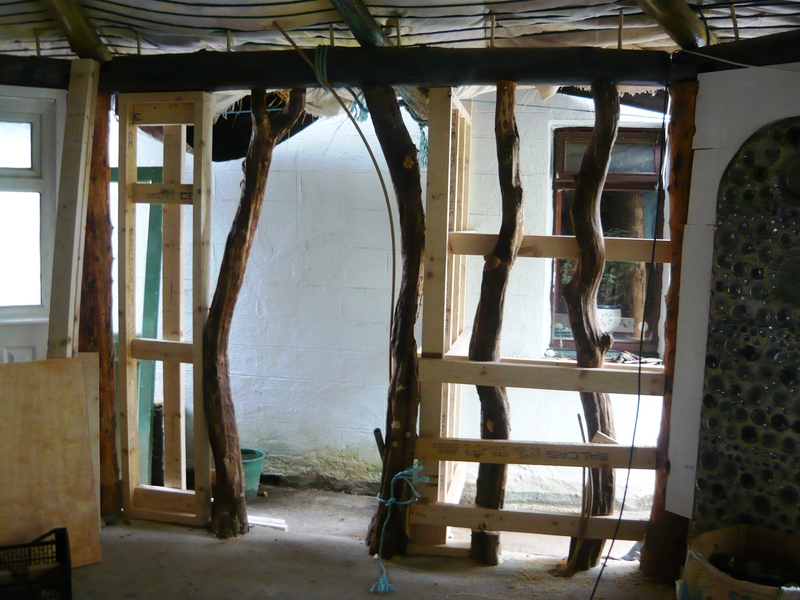 Yesterday we built the frames for the walls. A friend gave us some lovely hawthorn trees and we decided to incorporate them in one of the walls. 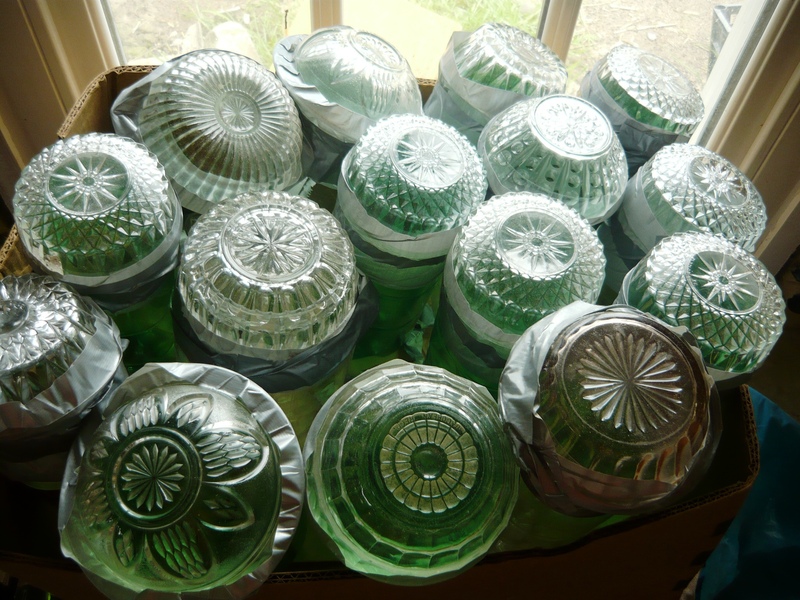 The bottom bit will accommodate a radiator and the top section will be built out of glass bricks. 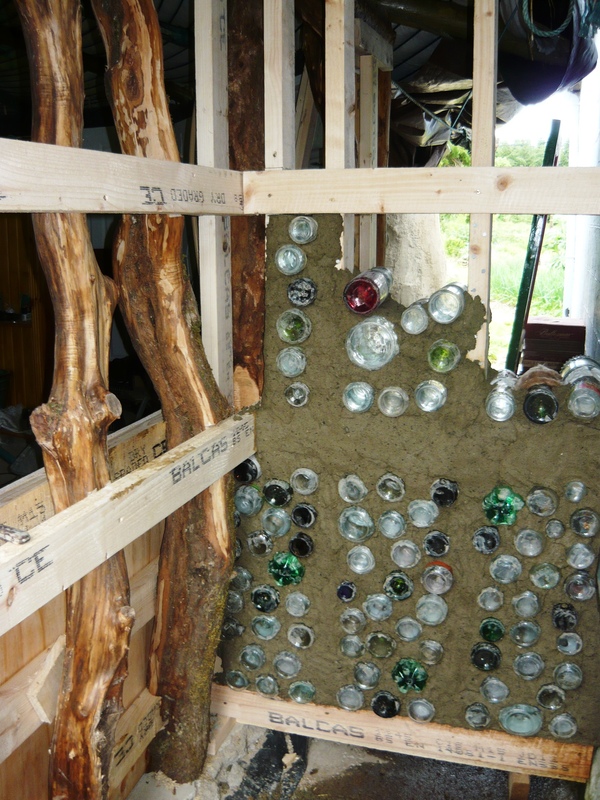 The other wall will be built entirely out of bottle sections. 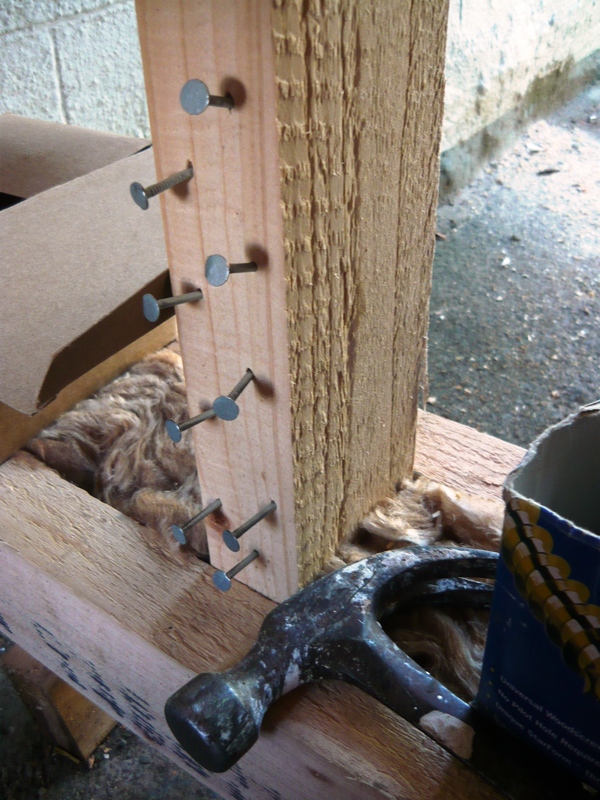 It is important to add lots of nails for the mortar to grip onto. We try to aim for a rather stiff mortar mix, a bit like mashed potatoes. You can experiment a bit with this. 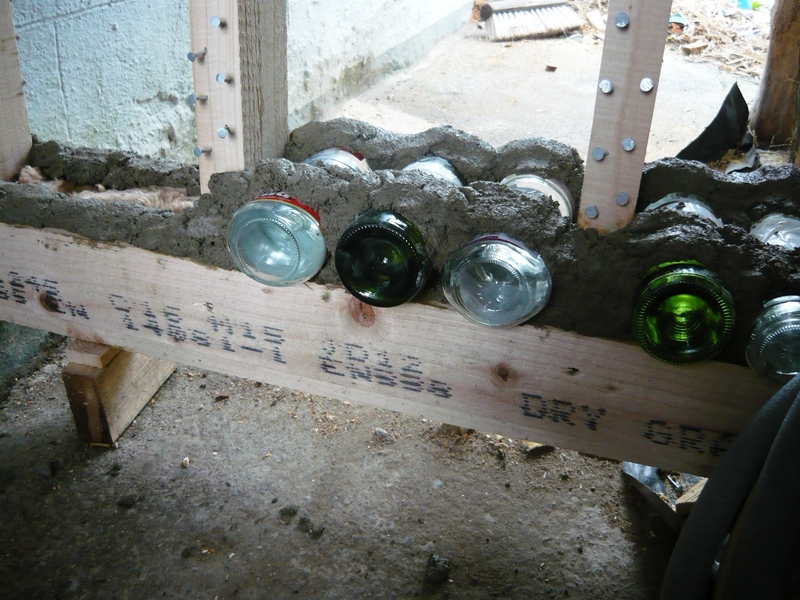 If the mix is too stiff it is difficult to make it reach all the crevices in between the bottles but if it is too loose it will not hold the bricks securely in place and bulge out between them. 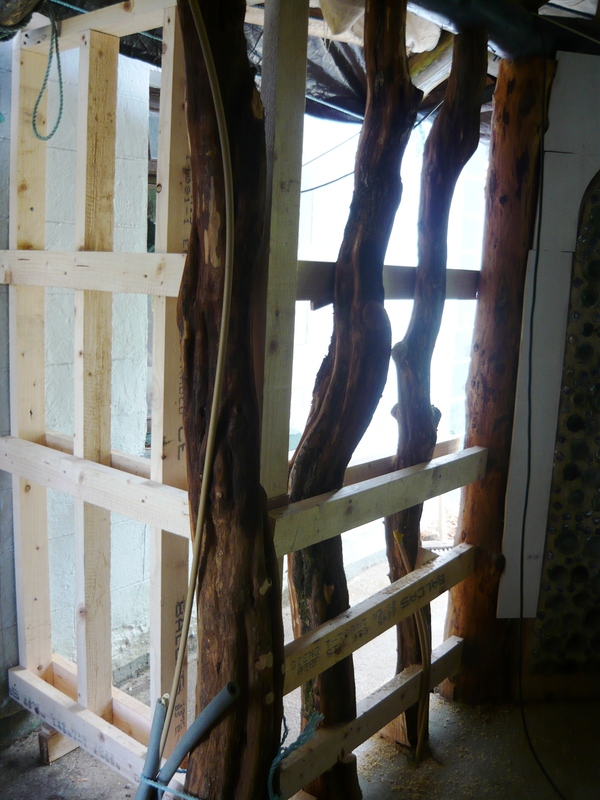 It is advisable to make a lot of small sections out of wood as this makes for a stable and sturdy wall. We put nine sections in this wall and at the top middle section we will add a nice big bowl with a sunburst design. We managed to fill about half the wall with glass bricks today and are planning to do the rest tomorrow. It is a quick building technique once you get used to it. We always put the mortar at each end of the bricks and add insulation to the middle, this also cuts down on the amount of cement used. It is rewarding to see the wall go up, knowing that you are building mainly with materials that are free and readily available. We are planning to use a bit of grout later on the inside of the wall for a smooth finish. ← June in the kitchen garden.